Halloween apple oatmeal cookies are awesome! Preheat your oven to 350 degrees. In a large bowl, combine together 3/4 cup sugar and 1/2 cup shortening. Beat in 2 eggs. Combine 1 cup flour, 1/2 teaspoon salt, 1 teaspoon baking powder, 1/2 teaspoon ground nutmeg and 1 teaspoon ground cinnamon. Stir into the sugar and shortening mixture and blend thoroughly. Add in 1 cup diced apple, 1 cup rolled oats and 1 cup chopped nuts. Stir up. Bake for around 15 minutes. Decorate as creepiest as possible. 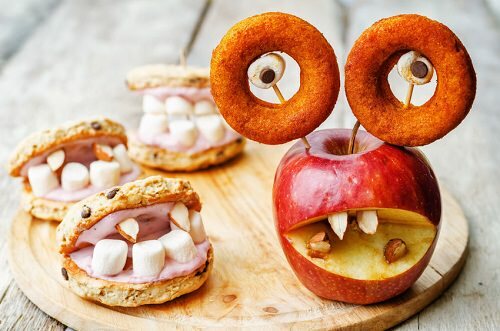 You can create some pretty neat Halloween treats without spending days working on them. While there are plenty of more complicated ideas out there, the ones on this list will allow you to whip up a bunch of different themed foods within a couple of hours. What are your favorite Halloween treats?